Plans are taking shape for a scientists' march on Washington as US scientists and public officials are finding themselves the forefront of the resistance to Trump. Staff at key agencies have responded to the social media lock-down imposed on them by creating over a dozen anonymously run Twitter accounts such as @AltNatParkSer, @altUSEPA and @RogueNASA to share climate science and crucial facts. In less than 24 hours, @RogueNASA alone has garnered 275,000 followers. The Twitter resistance seemed to be sparked by the official Badlands National Park twitter account tweeting climate science in defiance of the media shutdown. While the tweets were deleted (and attributed to an ex-employee), they were screenshot and widely shared. We are deeply saddened at the death of our friend and great climate campaigner and socialist, Ken Montague, who passed away last Friday. Below are tributes from Suzanne Jeffery and Jonathan Neale. Ken was secretary of the Campaign against Climate Change trade union group and a member of CACC steering group for many years. During that time Ken played an invaluable role in developing the work of the trade union group and especially the One Million Climate jobs report and campaign. Ken's work was unseen and often unsung but without it much of what the CACC trade union group have done in the last few years would not have happened. Ken's work allowed the trade union group to campaign increasingly effectively within the wider trade union movement, to develop a deeper understanding of the climate crisis, its relevance to the struggle of working people and to counter the false narrative that jobs and the environment are mutually exclusive. UPDATE: Tina walks free from court. 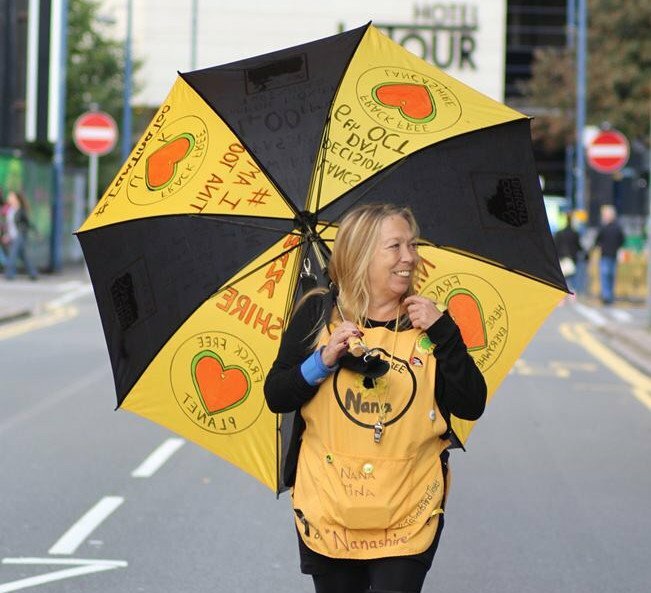 Tina Rothery, Lancashire Nana and anti-fracking campaigner, is being aggressively pursued for legal costs of over £55,000 and the likelihood of a possible two-week prison sentence, thanks to the actions of fracking company, Cuadrilla. Her supporters, including well-known figures such as Emma Thompson, Vivienne Westwood and trade union leaders, as well as NGOs and campaign groups, have today called on Francis Egan, CEO of Cuadrilla, to drop the case as completely unjustified. Hundreds are expected to gather outside Preston court on Friday when her case is heard, under the banner #IamTinaToo.